I think this is a fun and useful style of post that any WordPress blogger can do. It's always interesting to hear in what ways people are extending what WordPress can do out of the box. I'll share the ones I'm using here on CSS-Tricks then you can share yours (either in the comments or in a post on your own WordPress site). My list is quite a bit different than the last time I did this in 2008. If you have some better alternatives to the ones I'm using, I'm always interested in that, too. Allows me to create new buttons in the post editor of my own creation. I have buttons like "jQuery" which allows me to select some code I'm putting in a blog post and it wraps it in the tags I need to make it look like code and be syntax highlighted. Default buttons plus many of my own. Gives me more control for how I output excerpts of posts. For instance, which tags specifically should be removed and which can stay. Also allows for one-off control with a custom function. e.g. Has blocked 148,338 spam comments at the time of this writing. Invaluable. Extremely old but still vital for me. Turns new comment notifications from being plain text with big long gnarly URL's all over them into a simple HTML email with clickable links. I turned this off recently thinking maybe this has made it into core, but it hasn't. I think it's time to make WordPress start sending nicer emails, no? Also extremely old but still works great. All it does is make sure that I don't have to escape HTML code myself. If it's inside <code> tags it does it automatically. Makes sure all RSS feed requests get shuttled over to my FeedBurner feed. That's best because 1) then I can track statistics accurately and 2) it relieves some load from the server. Gives me the ability to reward good comments and discourage bad comments. All I do is click links in the comment thread to apply class names and I style them. This is just one small tool in curating good comment threads. More on that here. Speaking of better comment threads, I believe allowing people to see what their comment will look like before posting helps that. Especially on a site where people post code fairly frequently and how easy that is to screw up. 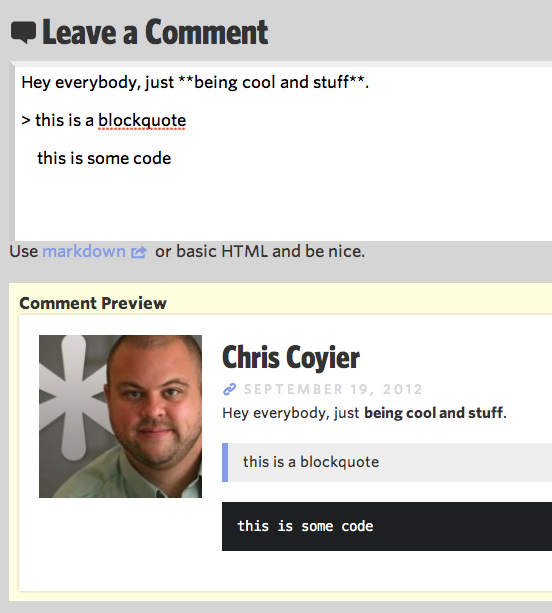 See the next plugin and it's notes for how the Markdown preview works. Lastly related to comments, I allow people to write them in Markdown. I did this because 1) it's consistant with the Forums, which also allow Markdown and 2) I like Markdown. There is a lot of stuff in here, but at the moment I only use one feature: the ability to let users get email notifications of follow up comments or new articles on the blog. I have it set up so that when Lodge members log in (which is the default WordPress login system), they go straight back to The Lodge. At the end of each blog posts, lists a couple of other blog posts that people might be interested in reading. The idea is to be helpful to readers with the side bonus of keeping people on your site and engaged. The heart that makes The Lodge work. Some content just isn't availble to view on the site unless you've logged in and have an active subscription. This makes all that happen. I use the PayPal Pro and CSV user import plugins for it. Plugin plugins! Does full site and database backups for me. Peace of mind. Keeps CSS-Tricks speedy. Does the CDN integration with NetDNA automatically. Allows me to force certain pages on CSS-Tricks to be SSL just by checking a checkbox. For instance, I do this one the Lodge Signup page, because it collects payment information and that really needs to be secure. If you're using a CDN, make sure it can handle HTTPS too. Make sure all resources you use (images, CSS, JS, fonts...) are also HTTPS. Takes care of all the little best practices stuff that is tedious to deal with otherwise. Things like using ideal page title formats, proper meta tags, canonical URLs, sitemap building, social media data, etc. Handles the polls around here. What are some of your can't-live-without plugins? I’m looking for a good commenting plugin, are there any or should I just take the default one and CSS it to my taste? Very usefull post Chris, I’m gonna use a lot of these, thanks. Very helpful to see this list, since their value has been “proven” (so to speak) on a popular site. What I miss though, is which are the “best” plugins for custom post types and custom fields. I really like Custom Post Type UI and Just Custom Fields. They work fine for me but (as with everything), I always wonder if there’s something better out there. Also, the lack of a contact form plugin makes me wonder if you would advise everyone to use a Wufoo-based form in their WordPress site, or if that’s just your personal preference (and since you used to work there)? The Jetpack plugin I mentioned above has contact forms. But yes I would recommend Wufoo, and not just because I worked there, but because it’s definitely the best form building app and works perfectly well with WordPress (even .com). I tested a bunch of these and settled with Pippin’s Easy Content Types for CPT management. For Custom Fields, I like Advanced Custom Fields. I second Gravity Forms. The agency I work for bought a developer license and it was a matter of weeks that it payed for itself. Awesome write-up. I always wonder what other blogger’s WP experience is like. I use a lot of these already but I need to start using AddQuickTag! As a developer I love the exec-PHP plugin, allowing scriptlets I write to easily be injected into pages and posts. I love exec-PHP too. It’s just really nice to be able to run PHP on a WP created page. Saves a lot of hassle. Absolutely agree. Exec-PHP is totally indispensable! Sometimes you just need a few lines of server-side code, not some bloated plugin, and that’s where this comes in. I find Advanced Custom Fields to be pretty indispensable and use it in just about every project I do now. I haven’t found a better way to allow different types of content while making it easy for users to maintain everything. Doh! Just saw your comment after I posted my endorsement of ACF. It’s good stuff. @Scott. I agree. I use ACF more and more. Very well done and great support. I use with custom post type, instead of widget staff, for home page Gestion. If you use Flexible Content Field, you can make very complexe lay-out easy to manage on client side. ACF is the most useful plugin I have ever used. And it only gets better with each version. ACF along w/ Custom Post Type’s allows me to do some amazing things for clients as far as designing an extremely easy to use CMS. Try it for yourself. Get brave, mixin some PHP and BAM! Yeah, ACF is awsome. I use it all the time my self. Advanced Custom Fields is probably the most useful plugin I’ve found, especially for client sites. It really gets WordPress feeling like a capable CMS by allowing you to completely customize how content is put into pages, posts, etc. Instead of the big ‘ol WordPress box, you can break everything up into discrete fields that make complex layouts easy to manage and harder to break. True, we’ve had custom fields for a long time, but to really use them you need some WP Jedi skills. This plugin makes them easy and takes them to a whole new level of awesome. The gallery add-on ($) is fantastical. Wow that is clearly very popular with the shoutouts in this comment thread so far. And look at those ratings! Ha! Great minds think alike (and about the same thing at the same time, apparently). I use Advanced Custom Fields for every client now, along with the Repeater and Options Page add-ons. I just used it for a custom restaurant menu on a site, it’s so flexible. Been using Advanced Custom Fields on almost every WordPress site lately.. it’s a great way to set up nice visual, more advanced fields for clients. One other one that saves time getting things set up initially: Bulk Page Creator. Lets you create many pages at once instead of one by one. Thanks for mentioning this plugin. I could always use it. Holy cow…thanks @Gabe. There are countless times I could have used that plugin but never thought to look. Advanced Custom Fields — Custom fields, simple as that. Automatic WordPress Backup — Nightly backup to Amazon S3. I backup all my sites for less than $5 a month. Portfolio Slideshow Pro — I’ve tried a lot of slideshow plugins out there. This one is my hand’s down favourite. Widget Logic is very handy indeed, but you need a little php knowledge to use it. Needs to be in WordPress core if you ask me with a few nice UI tweaks. Anybody know if Feature Comments works with Disqus? I use Google Authenticator for two-factor authentication. Chris, this is excellent. I use W3 Total Cache and WordPress Seo. They are absolutely the best. I use plugins similar to others that you use, but I really need to use AddQuicktag and WP Page Numbers. Polls would be a nice addition to my site as well. Vaultpress would probably be a good idea as well. I have heard only good things about them. Thanks Chris, for giving us some insight to what a true pro in the field uses on their WordPress site. I was waiting to see someone post about Types. That plugin has become a necessity for me in terms of WordPress development, it makes creating Custom Post Types so ridiculously easy and allows for wonderfully advanced customization with a few clicks. Glad to see CF7 finally get a shout out. Can you explain how you set W3 Total Cache Plugin for your site or show some screenshot of setting? Yeah, the setup scared me off using it…. But I know I should be…. I’d have to agree with Gabe – Gravity forms is freakin awesome. What do you think you’ll do when Feedburner is shut down? Chris, yes it is just a rumor. But the evidence for it are pretty solid. So the API is officially shutting down in October, but the service looks like it will stay around. Maybe someday they’ll kill it too, but I doubt they’ll upgrade the current status and tell us the whole service is going down too. I have a hunch it will stick around — I imagine it’s pretty valuable data to google to have so much public content flowing through their service. Advanced Custom Fields – ★★★★★ – should become part of core! Gravity Forms – best form plugin out there. Latest Published Updates – lists latest edits on dashboard and who edited them – nice for clients who have multiple web admins. Query Posts – grab posts in a widget with tons of options. I usually program my homepage to be a bunch of widget areas and populate spots with content with this. ZigWidgetClass – add classes to widgets, sounds simple but it’s awesome. we should have to rely on arbitrary ids to style widgets. just the thought of having to redo all of those feeds …&$#@! I’m actually a Google fan — in spite of this deprecation. Looks like they’ve been thinking about HTML emails in core for awhile now, according to this ticket. Hey Chris, what kind of stack are you running? Are you using nginx, varnish, or any kind of page or opcode caches? I kind of agree, but I also feel that it is bad to reinvent the wheel, unless the issue with the wheel is such that you can only take parts of the existing wheel to make the wheel work the way it should. …And I think I might be tired, that comparison was a bit weird. That said, if the theme is just/mainly for one client/oneself, one might as well. If it’s for sale/other, I am concerned about people losing settings/stuff if there’s too much built into the theme. I love you, Chris, but you may need a spell check plug-in too. 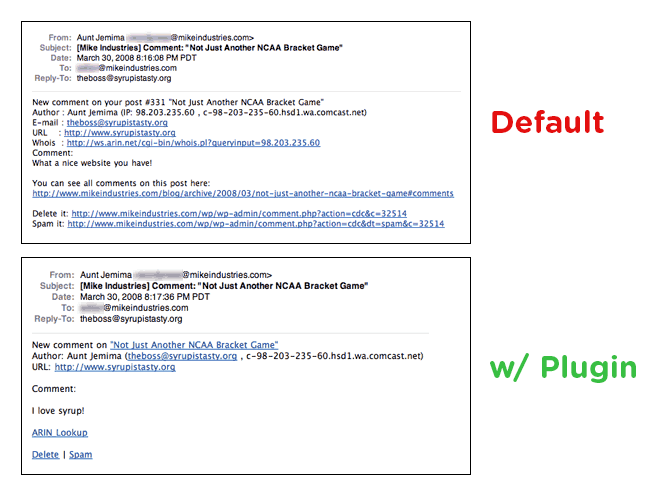 I fixed that email address problem for you. And it’s way helpful if you can point out typos for me instead of just tell me they exist. Thank you and will do. Not trying to be a d-bag but I am so distracted by typos and (shiny things) that it is a wonder that I get anything done. I try to fly bare bone but if I must, Gravity Forms, Contact Form 7, BackupBuddy, NivoSlider, Cart66. Just seems like any hack I’ve ever encountered have come in through plugins so I try to keep to just the trusted ones. In regards to ‘Advanced Custom Fields’, I used to use it a lot but now I just roll my own custom meta boxes. Keeps clients away from trying to feel like WordPress gods. Which plugin would you use to make Contact Forms? I use Gravity Forms and I think it is worth paying a few bucks to RocketGenius for it. If you haven’t checked out Wufoo, you should. It’s a hosted solution but it’s super solid and awesome. And for the record, as far as I can tell RocketGenius blatantly copied Wufoo’s interface. I simply can not live without Advanced Custom Fields plugin. Great post! I have a list here. I’ll be checking out Advanced Custom Fields now too! Thanks for the plugins :D Very Useful! Great info. I almost always rely on Contact Form 7 and its Database extension for quick form builds in the case when the client wants the responses stored. Advanced Custom Fields and Gravity Forms are invaluable to our business – turns WP into a vastly superior CMS (loving this live comment preview plugin – first time I’ve commented here). I started using Types before I found out about Advanced Custom Fields. Does anyone have an opinion about what Advanced Custom Fields does better? The benefit for types is the nice integration with views. If you are familiar with Drupal you will recognize the similarities. Great post! Have you tried embedded Gists for your code examples? I have used both Advanced Custom Fields and Types. I mostly use Types now, as well as Views. Views is a paid plugin, but useable on multiple sites – both Types and Views allow you to export / import so you don’t have to rebuild functionality on a new site… I use WPML for multilingual sites. Also, during development I have found Reveal to be handy in determining just which template is called in which situation…. (but remember to turn it off before going live!). Thanks for sharing. Great plugins! Thanks for posting this, I have just started using wordpress regulary on small sites that I am developing outside of my “real” job. Excellent recommendation, Advanced Custom Fields is a good addition to those listed in Digging into WordPress. Chris, do you think wp page navi would replace the old wp page numbers? nrelate Related Content – using linkwithin before this, but nrelate results are more relevant, I’m running my blog from shared server so I’m not confident using YARPP to do the task. RSS Image Feed – I have replaced Google Feed burner and use Mailchimp RSS-to-Email that provide much better customization, and it’s free for 2000 subscribers, but mailchimp rss-to-email doesn’t display the image so I used this plugin. Search & Replace – A simple search for find strings in your database and replace the string. Smart Archives Reloaded – An elegant and easy way to present your posts, grouped by year and month. Thanks for the list, Chris. Definitely checking out some I haven’t tried before. I myself keep a personal list of plugins on my site I use and trust (on my site’s menu, go to WordPress > Plugins, I’m not sure if it’s alright to post my own link here). I’m also wondering why you’re not using any social sharing buttons on this new theme of yours. Thank you very much. useful. Having only just discovered the Yoast plugin the other day, I can’t actually praise it enough. One of the most useful SEO plugins that I’ve found for wordpress so far. Some new ones in this list that I’m going to have to check out. It’s the only subscription management plugin I’ve tried, so I’ll have to take a look at the one you mentioned. My client had a use case that wasn’t handled by the plugin by default (limit user to x number of logins) and I was able to easily add the functionality using the plugin API. One that I use occasionally that is really useful is JSON API creates a nice JSON API to query wordpress for a lot of useful information. Used this in instances where the main site is on one CMS and they decide to add a blog and want to pull in recent posts or other things into that site. I just switched from Joomla to WP and after the headache of getting all articles over, adding images, I really needed some plugin tips. Thanks for that. Thanks for sharing your knowledge. Need help on adding Microdata and other semantic tags to make use of Google Rich Snippets. Great list, Chris. It looks like Advanced Custom Fields is worth some exploration. Nice list, very useful.Thanks for sharing. Contact form 7 and askimet are probably the two plugins I REALLY need. Awesome post and great to find some new plugins I have not used before. Are Forums also a plugin? That’s a good point. Is the forum a plugin? If so, which one is it? If not, how was it created? I see, I take it Vanilla forums is completely independent of wordpress then? are plugins that are a must for me. Though, it not relevant in this topics but I want say, it just a nice re-design. Isn’t it? I want to add functionality like facebook posts, I mean in facebook when I paste a link it grab a thumbnail, title and description from that link. Is there any plugin or function for WordPress? hi! chris, is that an additional plugin for the credit card payment on your lodge coz in Restrict Content Pro it has only paypal as a default? Posts 2 Posts – Allows the creation of many-to-many relationships between posts and users. This has helped me out on various projects, in tandem with custom post types. Great article, one of the better plugin listings, not sure about some of the ones listed. Biggest issue now with all the folks using WP (which is a good thing) is that so many plugins do similar things but use larger and larger amounts of bloated code. I am digging the login redirect by far. Does anyone have any recommendations for visual editors? I’m using Ultimate Tinymce now but would prefer something a bit sexier. I think Google Code pretifier or syntax highlighter is also plugin used by css tricks,isn’t it? Tnx for sharing your lists @Chris:) Found few cool plugins after reading this post which i was not aware of. Great FREE solution for backing up installs/databases. Lots of great recommendations. I recently bought views, creds and access from the developer of types. Impressive suite from front end functionality to backend capabilities. i tent to use Simple Ads Manager it is really effective. I am installing WP Page Numbers but there are a couple others Ive never heard about. Awesome, thank you for this page. What is best WordPress plugins for comment except disqus. which plugin do you use to beautify the HTML output of wordpress?